Presnap Read has their Army preview up. Army appears at #88 of their countdown. It's a fair place to put Army, who brings back a backfield of talent, but lose a little bit on the defensive line. I prefer Phil Steele's ranking of #80, but only because that ranking is above #81 Navy. Presnap Read is as complete a preview as we've seen to this point, and most of their concerns for this team lie in the intangibles. Can Steelman remain healthy? Can Maples replicate his breakout season? Can the backfield as a whole avoid injuries that plagued the group during the spring? More questions, this time about the offensive line: Can this starting five find a groove? Can they remain healthy? Does Army have enough depth to stay afloat if one, two or three miss an extended period of time? The offense has great potential; it has also several meaningful questions to address. And you can’t avoid two elephants still in the room: this defensive line and the stretch of 11 games over 11 weeks. If it comes down to talent, it's a bowl team - if the season is affected by injuries it could be another long year. Head on over to Presnap Read and read the whole preview. The University of Houston has their yearbooks scanned and available online, and it's a pretty good collection, too. The yearbook goes by the name The Houstonian and is complete from 1934 to 2008. Houston only started playing football in 1946, and most of their football history is represented here on the pages of the Houstonian. The collection is easily searchable, but perhaps best searched in their browser view. Houston's football reached its boiling point in 1989, when the NCAA levied sanctions on the program for recruiting violations committed between 1978 and 1984 under head coach Bill Yeoman. 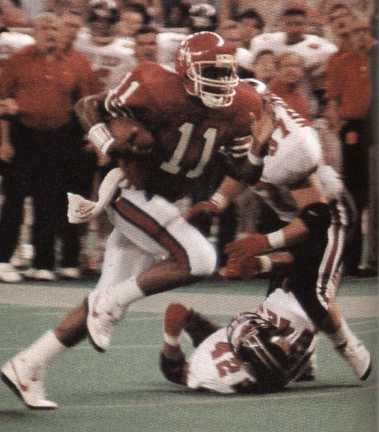 The sanctions would take effect after the 1989 season but Houston's season was already finished: 9-2; Alamo Bowl bound behind Andre Ware a Heisman winner who threw for 4699 yards and 46 TDs.